I feel suicidal and lost interest life. Can you help me, as I don’t want to lose my Sikhi? We are very concerned about you after hearing from you. First thing to realize is that you are not alone in this. We, and other Gursikhs and Sangat, are here for you. We may not be able to understand exactly how you feel, but we care for your well-being and want to help in anyway we can. When did you begin feeling like this? Did something happen that made you start feeling this way? Death is a permanent thing. It cannot be reversed. Have your ever thought of how killing yourself would make your mother, father, siblings and loved ones feel? Do they deserve to go through this agonizing pain and trauma? Be honest with yourself and ask yourself, do you want to permanently end your life or is it that you wish to change your life and circumstances? It more than likely that your wish to change your life and circumstances. You may not believe it now, but the way you’re feeling will change. Suicide is never an option for a Sikh. Why? Because our life belongs to Guru Ji. We were born to live, breathe and serve for Guru Ji. You have Master, Sri Guru Nanak Dev Ji, who you belong to, who loves and cares for you. A man visiting a holy man asked for his blessings and some spiritual advice that he could cherish for the rest of his life. The holy man wrote something on a paper and put it in an envelope and sealed it. With a pen he wrote “Sadness” (Dukh) on the envelope. He then got another paper and wrote something on that and sealed it an another envelope. He wrote “Happiness” (Sukh) on this envelope. The holy man said, “Dear son, when you reach a point in your life when you feel life can get no worse and that you are extremely unhappy and sad, I want you to open the envelope labelled “Dukh” (Sadness). When you reach you a point in your life when you think life can get no better and you are extremely happy then I want you to open this envelope labelled Sukh (Happiness).” The man carefully took these envelopes home and stored them safely. Later in life, the man lost his friends that he thought were his friends, his business failed and he suffered personal problems. He reached a point where he felt life can get no worse and is feeling at the lowest point in his life. He became very sad and upset. He then remembered the wise holy man’s instructions and got out the envelope labelled “Dukh” (Sadness) from where he had safely stored it. The paper in the envelope read, “This time will pass too.” Reading this, it gave the man hope and confidence that his life would not always be like this and just like a storm comes and causes destruction, it is not permanent. After any storm people get back up and rebuild their lives and get on with things. Life improved for the man. Things picked up. He found a new company of good friends. His business picked up and his personal circumstances improved greatly. He reached a point where he felt as if life could not get any better. He was feeling on top of the world and very happy. He then remembered the wise holy man’s instructions and got out the envelope labelled “Sukh” (Happiness) from where he had safely stored it. The paper in the envelope read, “This time will pass too.” Reading this, the man realized that in good times he should be thankful and be grateful to God, in bad times do Ardaas (pray) and all the time do Simran. Good and bad times don’t last forever, however, accepting God’s Will sweetly gives one inner strength to get through the storm and enjoy inner-peace. Get professional help. Please speak to a counselor at your school, college, or workplace. Make an appointment to see your doctor. Suicidal thoughts can sometimes be triggered by imbalances in our body caused by various things. It is important to find these and get medical help. Get someone to follow-up on treatment. If the doctor prescribes medication or therapy, make sure you get a friend or loved one to make sure that you take it as directed. Be aware of possible side effects and be sure to notify the doctor if you feel you are getting worse. It often takes time and persistence to find the medication or therapy that’s right for a particular person. Realize Sangat is here for you 24/7. 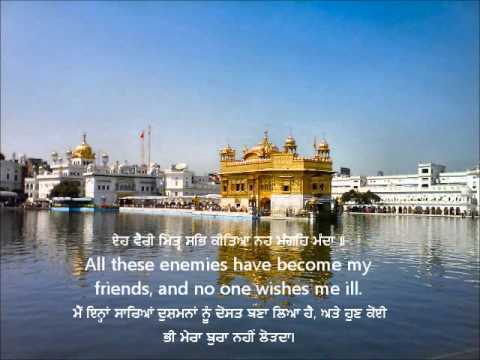 Share your problems with Gursikhs you trust. They will be willing to help. You can always contact Sikh Helpline anytime (call: 0845 644 0704 (UK)/ 07999 004 363 (UK); email: info@sikhhelpline.com). Get friends and Sangat to drop in. Get out with family or Sangat as much as you can. Make positive lifestyle changes. Eat a balanced and healthy diet. Home food is best! Ensure you get plenty of sleep. Go to sleep early so that you have 7 or 8 hours sleep and then can wake up fresh and early for Amrit-vela to do Nitnem and Simran. Don’t miss your Nitnem (daily prayers). If you have missed Nitnem prior to this, the first thing is to complete all the missed Nitnem and then get Ardaas done in Sangat for the mistake. It’s only when circumstances go totally out of hand and one has no control over oneself that missing Nitnem can be justified. If one is sick and does not have the strength to do Nitnem then one can listen to Nitnem. Also, make sure you get out in the sun or into nature for at least 30 minutes each day. Exercise is also extremely important as it releases endorphins, relieves stress, and promotes emotional well-being. Start a Sehaj Paatth. Gurbani is the cure to all ills. Make a strong relationship with Guru by getting to know your Guru. Do an Ardaas and start a Sehaj Paatth (slowly noncontinuous reading of all of Sri Guru Granth Sahib Ji). Try and read the translation/meanings as you go along. Reading Gurbani will give you a new lease of life, something to look forward to, and make you feel rejuvenated. Nowadays, you can read Gurbani on your iPhone, iPod or laptop. You belong to Guru Ji. Always remember, that although people may let us down, Guru Ji will never let us down. Guru Nanak Dev Ji’s door is always open. All we need to do is open the doors of our heart. Remember you are Guru Ji’s child and that you mean something to Guru Ji. Life and death are in His hands and pray for strength to live to share with others, serve humanity and enjoy Guru Ji’s blessings. Hope that helps. If you need help in contacting Sangat/a Gursikh in your local area or nearby that can help and provide you with spiritual and religious support in your journey then please let us know via our contact page. « Do Sikhs practice shunning or excommunication? I m suffering from weak heart…..my thinking goes weak……is bcz of my past krma??? ….diseasea of mind are also due to past krma?? My mother was in the same situation but when we took her to the doctor’s, it was confirmed that her body was no longer producing a required chemical and medication and praying helped her. Now she is okay and does her nitnem and runs the house.Dukh daroo, take this as a sign to get help when needed. We all go through our challenges in life, key is to learn, ask and grow.